As a native of the Finger Lakes region, Dr. Waldeis was pleased to be able to establish his home and practice in Naples, NY in 2007. With over 15 years experience in the practice of chiropractic, Dr. Waldeis has worked in both a large clinic setting (Syracuse, NY) and a multi-doctor group practice (Hornell, NY) before settling on a private family oriented practice in the historic village of Naples. 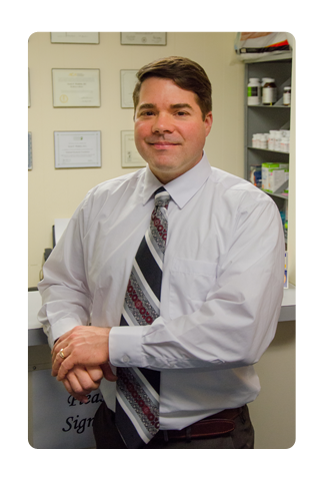 In addition to his practice of chiropractic, Dr. Waldeis is a faculty member of Alfred State College, where he is a lecturer of biological and health sciences, teaching courses in anatomy and physiology, pathophysiology, human biology, exercise physiology and nutrition. As a graduate of New York Chiropractic College, Dr. Waldeis received his Doctor of Chiropractic degree in 1998. Prior to his chiropractic education, undergraduate studies in human biology led to an associate and a bachelor degree from the State University of New York. In 2006, Dr. Waldeis was awarded a fellowship to the University of Bridgeport in pursuit of a Master of Science degree in human nutrition, which he earned in 2007. A firm believer of life long learning and continuing education, Dr. Waldeis keeps abreast of current research, approaches and techniques, through formal education, his affiliation with professional associations, his regular review of professional journals and his academic involvement at Alfred State College. Dr. Waldeis is a Doctor of Chiropractic having completed a professional doctoral program of study from a fully accredited private college of chiropractic. He is board certified having completed all sections of the National Boards of Chiropractic Examiners. Fully licensed and registered by the New York State Education Department's Office of the Professions as a Doctor of Chiropractic, Dr. Waldeis is afforded the ability to practice the full scope of his profession. Additional New York State licensure includes state certification as a clinical laboratory technologist, enabling Dr. Waldeis to perform extensive diagnostic testing in a clinical laboratory setting. It is the mission of Naples Valley Chiropractic to provide the highest quality of chiropractic care to those entrusting their health to us. We strive to create a friendly and inviting environment where we focus on giving personalized attention to the healthcare needs of our patients in a professional manner. "I can think of nothing more satisfying then spending quality time with family and friends! While enjoying the company of my wife and five sons, our leisure time is generally spent enjoying the "great outdoors." Whether swimming or skiing, hiking or fishing, as outdoor enthusiasts, we enjoy all four seasons of the Finger Lakes region."